To Dr. Bergen McKee, the talk of witchcraft on the lonely Lukachukai plateau meant only an opportunity to prove his theory of the social usefulness of superstition. To Joe Leaphorn of the Law and Order Division, gossip about the Navajo Wolf spreading among the Red Forehead Clan, meant a threat - potential trouble of the sort he was hired to prevent . But to Luis Horseman, chanting to the Talking God on the rimrock above Many Ruins Canyon, the Navajo Wolf was real and terrible. Luis was on the run and now this big man with the wolf skin denied him his safe hiding place. Then they found Luis' body - its mouth filled with sand - and the talk of witchcraft took on a new dimension. For one of Horseman's young kinsmen, it became a matter of revenge. For Joe Leaphorn, it became an urgent and baffling challenge to his logic. 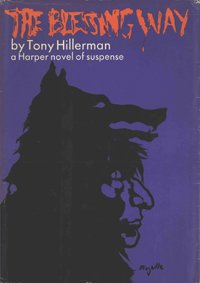 And for Bergen McKee, the academic problem of understanding evil became suddenly a question of life or death (Hillerman 1970: Promotional copy from the Dust Jacket).